I received an email from Rick a reader of the blog asking if I knew any good recipes that use Pimm’s No. 1. A Pimm’s Cup is the first thing to come to mind, however if you’re looking for more of a sophisticated cocktail then I’d recommend Jeff Hollinger’s 21 Hayes cocktail which draws inspiration from the Pimm’s Cup. This cocktail is named after the 21 Hayes bus line in San Francisco that runs outside Absinthe restaurant where Jeff invented this cocktail. Muddle two slices of cucumber to a pulp with the Pimm’s No 1. Then add the rest of the ingredients and shake. 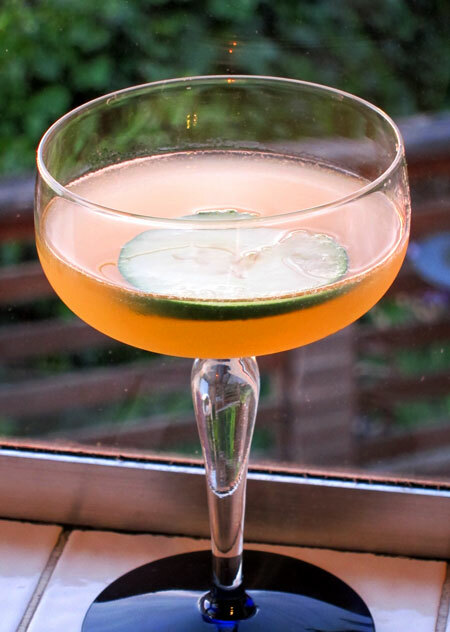 Strain into a cocktail glass and garnish with a cucumber slice. I made this cocktail for my friends last Friday and it was a HUGE hit. I was able to introduce Pimm’s no.1 to a new group of people and we had a fabulous evening. They all asked for the recipe. Thanks so much. Rick, glad it was a hit!